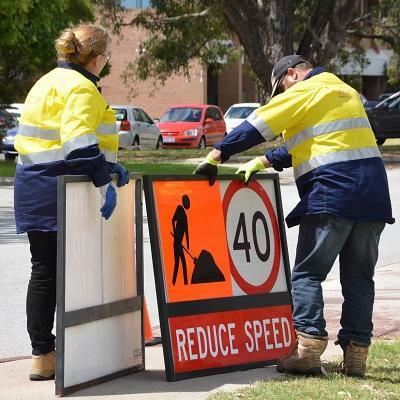 Traffic management and traffic control workers (referred to as Traffic Controllers or “TC’s) continue to be in high demand in Perth, Western Australia. It’s no wonder that so many people are seeking out these type of jobs: they are rewarding, flexible, provide a great deal of opportunity to be outdoors, and provide a valuable and needed service to communities all over Australia. If you have ever thought about becoming a traffic controller, now might be the right time to get the training you need, and start applying for jobs in your area. Here’s everything you need to know about traffic management and what traffic controllers do, how you can train to become a traffic controller in Western Australia, and how you can prepare to find an interview for a position. What Do Traffic Controlers Do? You have probably seen a few traffic controllers in your day. You will find them directing traffic and keeping workers safe on and around roads, rails and bridges all over Australia, including in the Perth area. Traffic managers and traffic controllers are responsible for a number of tasks related to road safety, including setting up, maintaining and pulling down road signs and devices as well as controlling traffic with a stop/slow bat. You can expect to work 8 to 10 hours a day managing the safety and efficiency of the traffic flow through the worksite. You will work closely with a larger team, sometimes spread over many kilometres. If you become a traffic controller, you can expect to be outdoors for a great deal of your workday, working in all weather conditions, day or night. There are often times when emergencies may require traffic managers to maintain signs and devices and traffic controllers to stop or slow traffic, so flexibility with scheduling might be important. Safety within the traffic management industry is taken very seriously. The main duty of a traffic controller is to maintain the safety of all road users and workers, whilst minimising the impact that the works have on road network. As part of the requirements to work as a traffic controller, there are strict safety related dress standards. These may include hard hats, cut resistant gloves and hi-vis vests so that you can be seen whether it is day or night, or in bad weather. You’ll also be required to wear steel toe boots while on worksites. Sometimes, you might be required to wear safety glasses to prevent injury to your eyes during road work, as well as earplugs to prevent hearing damage during construction of roads or any other works that you will find around roads. What Qualifications Do You Need Before Starting Your Traffic Management and Traffic Control Training? If you are interested in working as a traffic controller, you should be at least 18 years of age and have, or have had a valid driver’s licence. You will be required to show a valid White Card (or Blue Card) when working on any construction site, so this is also a requirement for traffic controllers. You should be able to read and understand traffic signs and understand the regulations related to driving on the roads of Australia. You should also be able to speak, understand, read and write in the English language. In addition, you might be expected to lift heavy objects during setup and tear-down of any traffic management site, so you should be able to lift 10 kg repeatedly throughout your workday. Finally, you should be physically capable of completing all of the tasks assigned to you during your shift in accordance with traffic control responsibilities. How Can You Train to Become a Traffic Control Worker in Western Australia? If you are interested in becoming a traffic controller, or traffic management worker, you’ll want to check out the entry level Main Roads Western Australia traffic management and traffic control training courses we offer here at Warp Training Australia. We offer a number of beginner, intermediate, and advanced courses in traffic management and traffic control to get you started in your career in this in-demand and rewarding field. The Basic Worksite Traffic Management and Traffic Control Course offers students a chance to learn everything they need to start working as a traffic controller in Perth and throughout the whole of Western Australia. You’ll get a combination of in-class and practical training to prepare you for what life is like as a traffic controller. There are a number of other courses available including the Worksite Traffic Management and Advanced Worksite Traffic Management courses that can be taken once you gain experience as a Traffic Controller. These courses will allow you to progress into a supervisor or planning roles and enable you to manage the safety and efficiency of the traffic managed worksite. Training involves in-class theory that is designed to prepare you for the problem-solving, safety and logical parts of the duties associated with being a traffic controller. Most importantly however the practical training gets you working right away out on a live road environment so you can apply what you learned in the classroom. You can get your certification on successful completion, which means you can be ready to work immediately. Our courses in traffic management and traffic control will provide you with everything you need to know to start working as fast as possible. In addition to the basics of road safety, you’ll also learn about communication and the importance of relaying proper information to your co-workers to keep everyone safe. You’ll also learn about implementing traffic plans and you’ll learn how to understand them. At the end of your training, the Main Roads Western Australia accreditation you receive from Warp Training Australia is good for three years. This month we are excited to announce our partnership with Hiya. Hiya is making it quick and easy for you to find work. By completing one simple interview, you can have access to all traffic management companies and labour hire agencies in Perth. By partnering with Hiya, we are able to get you in front of the top companies, meaning you’ll be starting your next job quicker. If you’re looking for work and would like some advice, contact WTA today and we’ll be able to help. Like any other job, you should do some preparation before your interview to give yourself the best chance of securing a position. If you opt to work with a staffing agency, you will still have to go through an interview so that the agency can recommend you for jobs that might come up. For a more traditional approach to securing a job you should arrive for your interview with the company dressed professionally and ready to answer questions about your previous work experience and training related to traffic management and traffic control work. Now is the time to make the move into a career as a traffic controller. Whether you have been in traffic control for years and wanted to upgrade your skills, or you are interested in breaking into this high-demand field, consider Warp Training Australia for all your traffic management and traffic control training needs.